Email campaign creation is done at every stage of nurturing and it takes the lion’s share of your email engagement strategies. 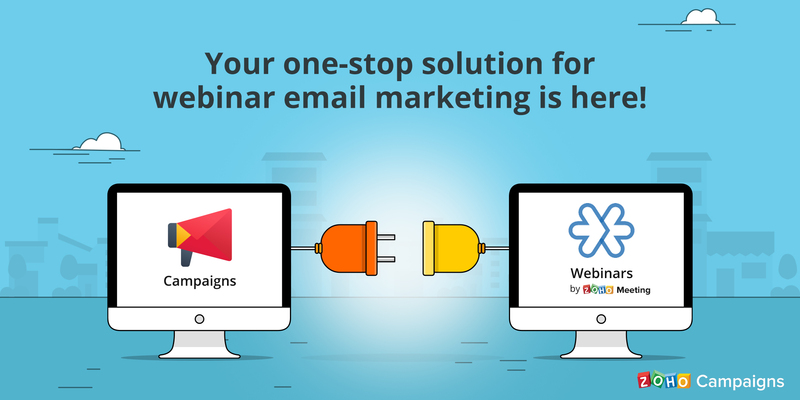 Somewhere between finding the right customers and catering to their needs, the process of creating an email campaign has become a repetitive task and has lost its charm. 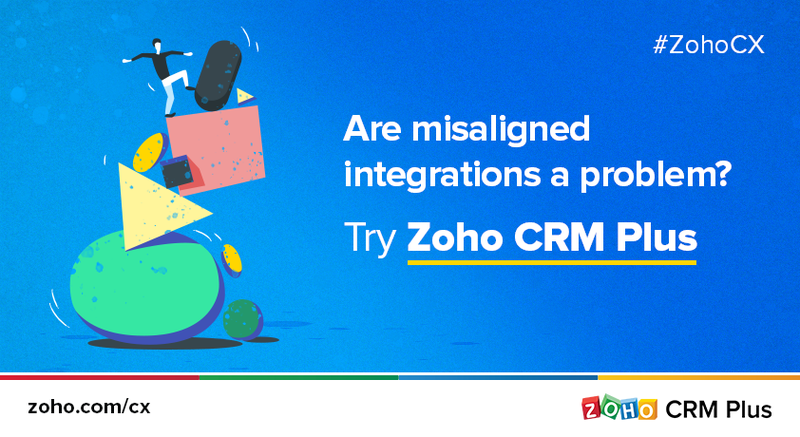 Zoho Campaigns brings back that charm by making campaign creation simple and fun. 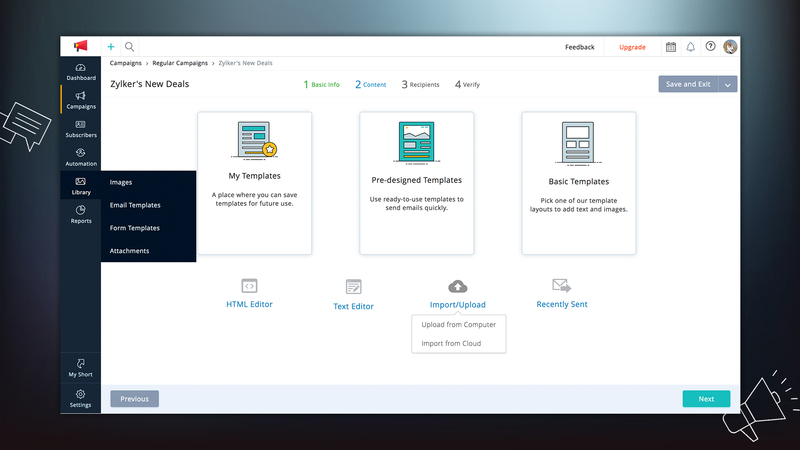 The latest drag-and-drop editor has all the capabilities needed to help you design the most professional email campaigns. Easy access: Choose from several advanced tools that help you create personalized, perfect campaigns. The best part is that you don’t need prior knowledge about anything. Everything’s so simple from the moment you land on our editor. Time saver: Refined elegance at every level of usage. You can find a visible reduction in the steps needed to do an action, right from dragging components to replacing blocks. Save more time and stay relaxed. More flexibility: Do things your own way. Design, redesign, and reinvent until you’ve found your best results. All our campaign editor tools were developed to help you create what’s best for each of your customers. You always like trying out things and don’t easily say “yes” to something that’s standard. You test components and then figure out the conclusion. You tend to adjust settings, be it changing the positions of different template sections, varying the background color, or making provisions for personalized content. 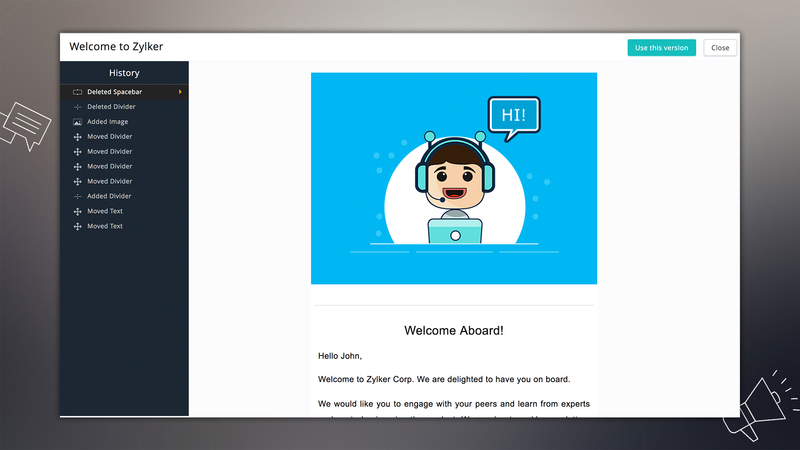 Zoho Campaigns’ editor comes with two exceptional features for you—Dynamic Content and Versioning. Dynamic Content keeps your messaging highly personalized and contextual. You can send a single email with hyper-relevant content that suits different segments of your audience. While experimenting with the layout, you might add or delete certain sections/components at every step. With Versioning, your every iteration is saved as a separate version, and you can work without the fear of missing any information for you can always go back to the version of your choice. You can also check your email previews using Litmus test option, to make sure that your email looks perfect on all the devices. You like visualizing something and working on it right from the start. You prefer things to go in progress, and you have an extremely creative mind. 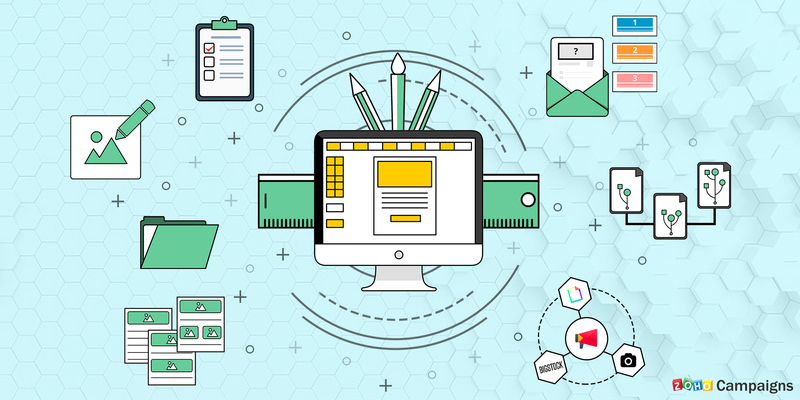 With an eye for artistic images and patterns, you enjoy designing visually-pleasing email campaigns for various occasions. 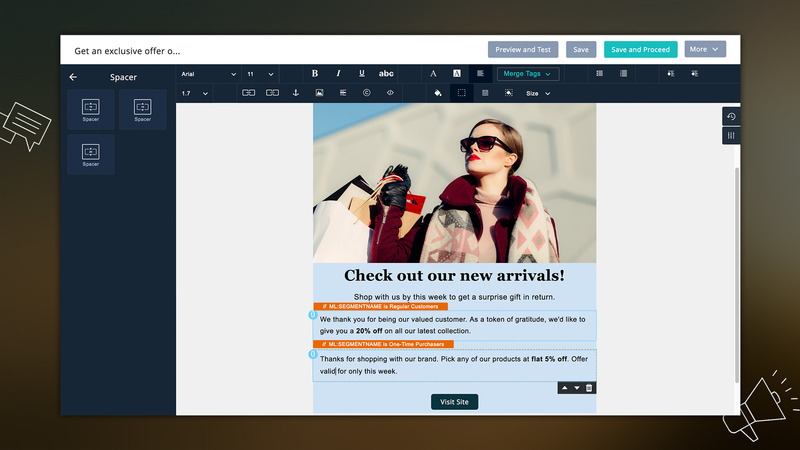 For people like you out there, here’s our new editor with useful tools like Attractive Templates and Image Editor. The template gallery comes with a wide collection of pre-designed, professional templates, so all you need to do is a simple pick-and-proceed job. All these templates are responsive and they look great on any device. 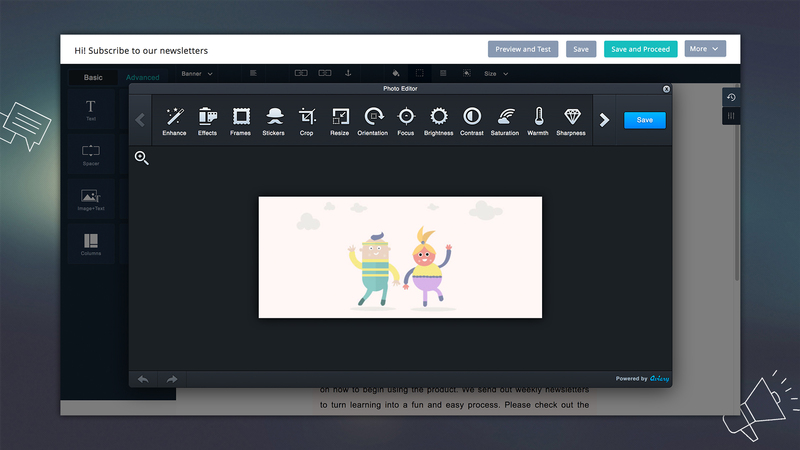 Aviary’s image editing platform helps you completely transform your images in just a few seconds. From basic moves like editing or cropping, to advanced moves like adding stickers and filters, you can do anything you need to make your template images stand out. As the name says, you are specific about details and you don’t mind spending those extra minutes making sure that your emails are right up your alley. In order to send out fine-tuned emails that are properly targeted at your recipients, you need to garner more information about them. What better way to do this than by holding a poll? 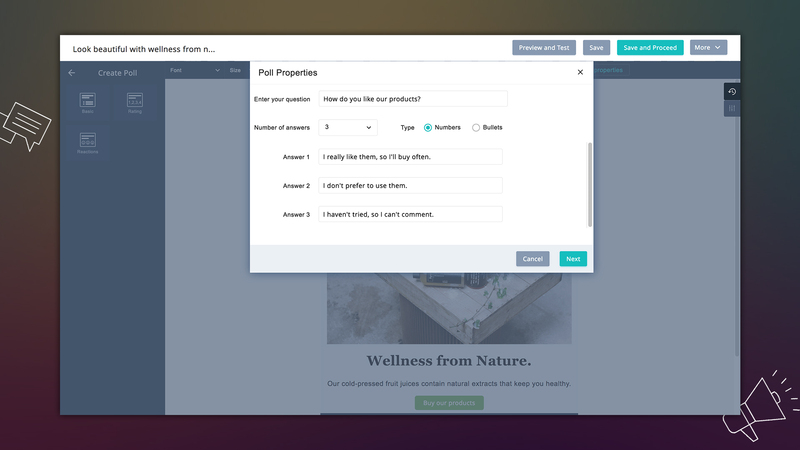 The Poll feature lets you attach a quick question with up to four options at the end of your campaign, so you obtain your subscribers’ opinions very easily. Want to know if your event invite is convincing enough? Just ask your recipients this question, analyze their responses, and use this information to enhance your campaigns in the future. 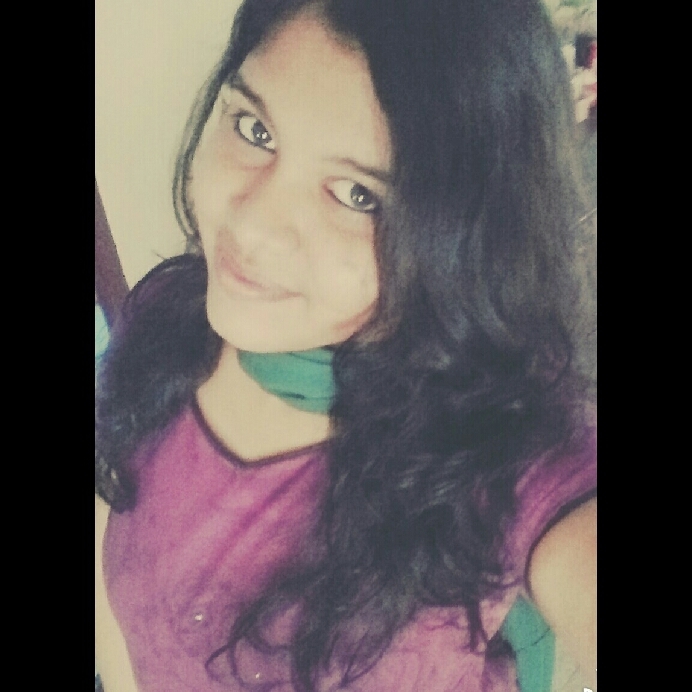 Anything that saves time attracts you. You aim to speed things up and prefer maintaining a repository for things you often use, whether they’re images or the content. You want something to be great and at the same time less time-consuming. So creating a campaign is nothing new, and you work to quickly finish it and send it off. Zoho Campaigns comes with an exclusive Library module to help you. Instantly save your images and templates to the Library, so you don’t have to rework them the next time you use them. Also, you can choose any recently sent campaign’s design for your upcoming one. Using Campaigns’ integrations with Giphy, Unsplash, and Bigstock, you can download desired images and insert them into your layout. 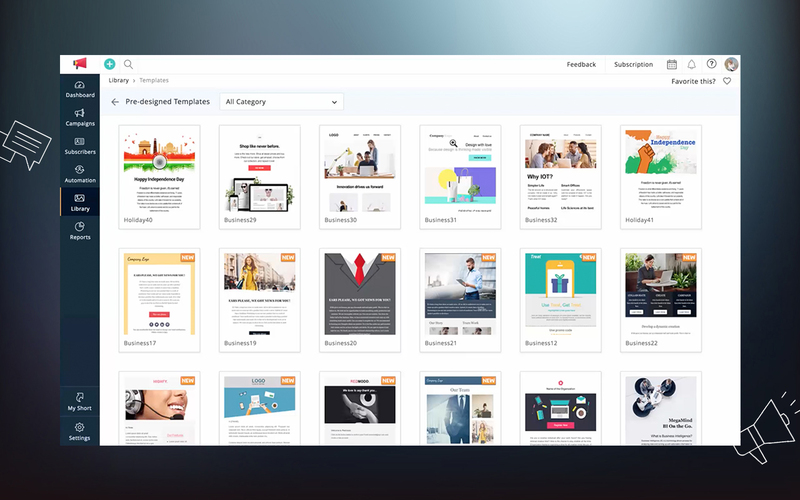 With tools that match everyone’s design requirements, Zoho Campaigns’ advanced editor is very-much available for you to use. Try it yourself, and let us know your feedback in the comments section. Where can I get help on Zoho Campaigns. Thanks for writing in! Please contact our team at support@zohocampaigns.com and one of our support professionals can schedule a call with you. Awesome web app! Any way to copy a themes Pages and Emails to existing lists? Thanks a lot! Regarding your question, when you set ‘Pages and Emails’ under Settings->Themes, then, then it’s global— gets reflected on all your mailing lists. If you want to tailor the ‘Pages and Emails’ for a specific list, you can do so by making changes inside that particular list. However, you can’t copy the theme that you’ve specifically used for a mailing list (after tweaking), to set up the same for another mailing list. Hope this clarifies your doubt!